I was really eager to see the results of this glaze firing as I'd tried a different firing schedule. In previous firings I'd basically brought the kiln up to cone 9 temperature, reduced for half an hour and then oxidation until cone 10 falls. After reading more about gas firing schedules I decided that I needed to have a much more controlled approach to firing if I'm ever to produced consistently repeatable results. I used two packs of cones in this firing; a set for the reduction stage (cones o11-o9) and a pack for the final temperature (cones 8-10). I steadily brought the temperature up to cone o10 and then put it into reduction for half an hour. I closed the dampers and partially blocked the flu with some firebrick. During the reduction I increased the gas pressure slightly. I was a little surprised to see the temperature continue to increase during the reduction, as it usually really slows at this point. Following the reduction I opened the dampers slightly (1/4 inch) and opened the flu to try and create a neutral atmosphere. the plan was to maintain these settings until cone 9 fell and then open all dampers for a final period of oxidization until cone 10 fell. However, the kiln stalled at just below 1200 degrees c. Cone 9 had fallen and the kiln was in full oxidation, but never reached cone 10. In retrospect I realise that I had the bottom shelf too low. It was packed with lots of flat heart wedding favors and a couple of canister lids, with the shelf above only an inch or so higher. The lids were a dull grey blue and had clearly not had a good reduction as they were meant to be a bright blue. 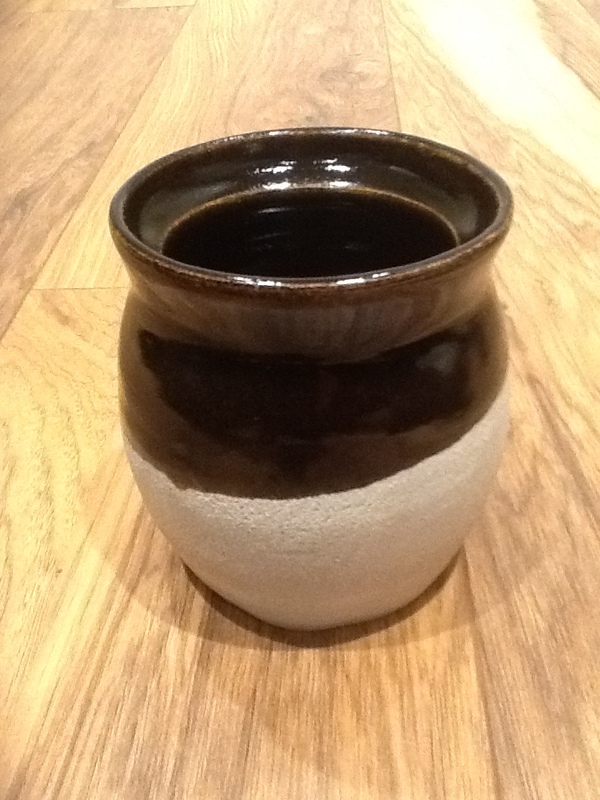 I think the low shelf had affected the convection within the kiln, resulting in the failure to reach temperature. Overall, the firing results were mixed. The tenmoku glaze fired well both in the top and bottom of the kiln. The reduction at the bottom meant that the canister lids were a different colour to the bodies which renders them as seconds. the wedding favours which were decorated with copper oxide fired well despite not producing the colours I'd hoped for. 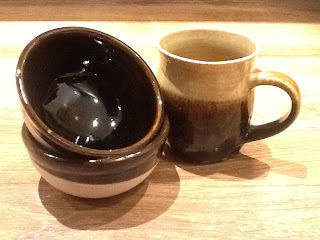 the glaze on a couple of the mugs ran onto the shelf and then split when they cooled. here a re a few photos. 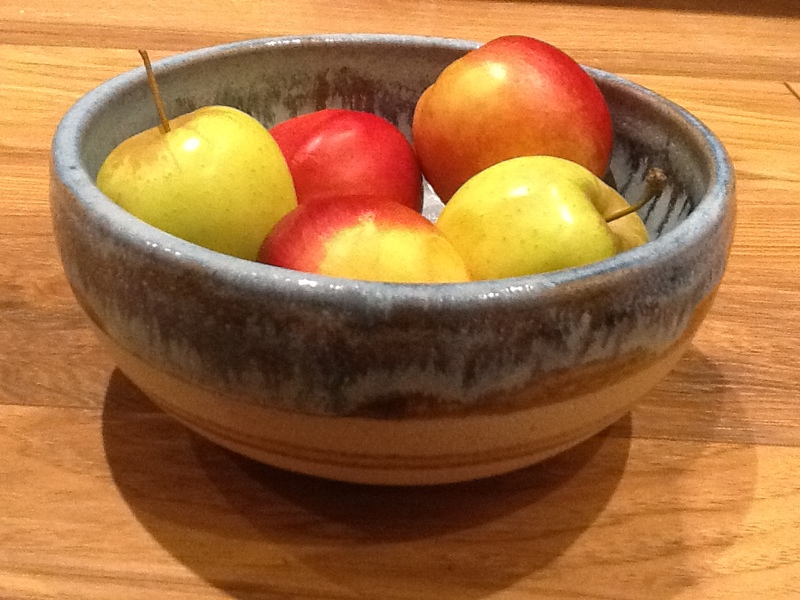 I was quite pleased with the fruit bowl. 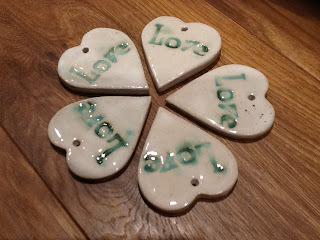 I made 50 of these favors, most of which were on the bottom shelf of the kiln. the writing had copper oxide rubbed into it. A combination of their position in the kiln, the lower temperature / poor convection led to the resulting colour I think. The Tenmoku glaze fired really well throughout the kiln. 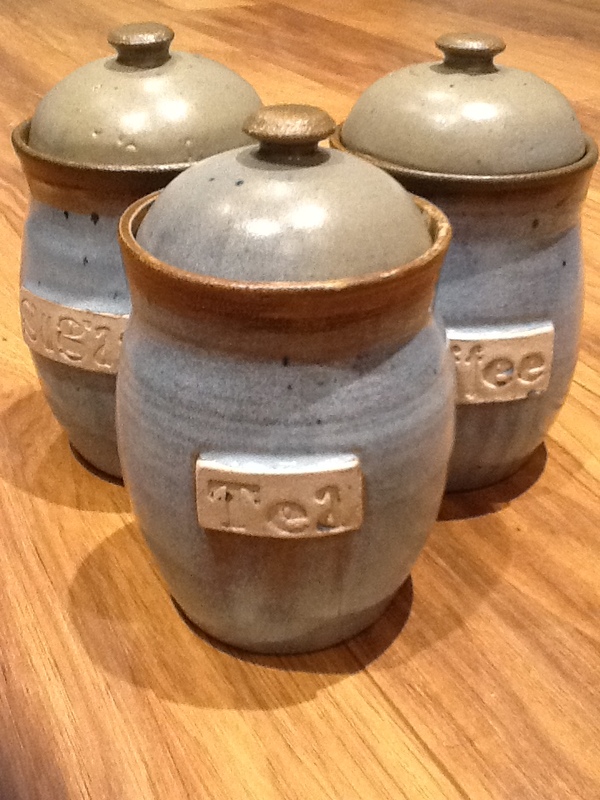 I stupidly placed the lids of these canisters in a different part of the kiln to the bodies, hence the colour difference.